I have changed my mind so many times over the last few years, months, weeks, days, minutes, moments, about how to best care for a husband, 79, in a nursing home, and our son, 21, embarking on adulthood. It’s doubtful whether Ming will want chooks in his future life! Not very long ago, whenever people talked about the weather, or gardening – whether it be small-talk or serious-talk – I would tune out. I have never been the least bit interested in anything relating to the actual job/hobby of gardening despite numerous attempts to get interested. Gardening was Anthony’s ‘thing’. His family (mother and younger brother) came here in the late 1950s to run a dairy farm and Anthony began planting things – camellias, palms, silver birches, flame trees, roses, citrus, hedges … and a whole lot of other stuff. Up until the year before the nursing home, Anthony was still interested in planting, watering, and wandering about, in the garden. But he would get stuck! We only had the walking stick then so he would go out the back to check on a hose and then become paralysed and sometimes it took a whole hour to get him back to the house. Then, one day, when he was in his armchair in front of the fireplace, I told him not to move while I went up to the shop to get some supplies, only to find him face-down in the front yard; he’d fallen again! Parkinson’s disease (and all of its off-shoots, including dementia) is an ever-changing condition that can make life tricky for those who care for family and friends inflicted. 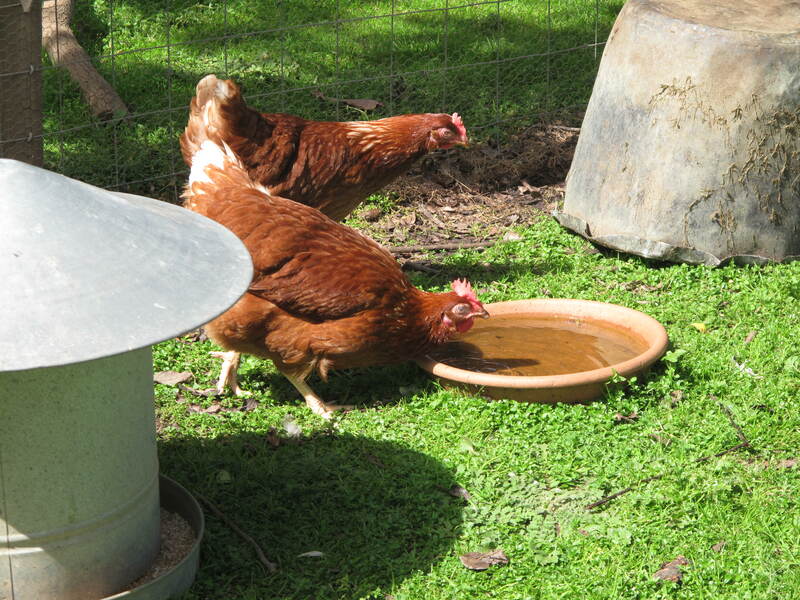 For example, sometimes I can show Anthony photos of home – the new chooks, the better-kept garden, the mowed lawns etc. and he will think he has been home. But, at other times, Anthony will ask to come home and I will have to distract him. This is not because I don’t want him to come home; it’s because he is mostly immobile now so I actually can’t physically manage him. The guilt is ghastly of course but it is easily blitzed by my almost-daily company, in the nursing home, during the afternoons. 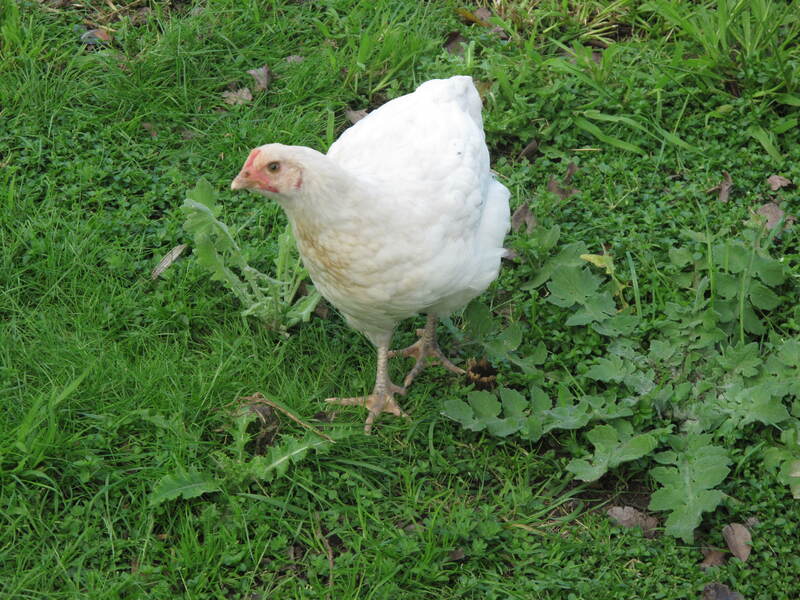 And photos of the new chooks! This morning this wonderful group of gardening people came over (it’s a group I’ve recently sort of joined) and each person had a good piece of advice for me. 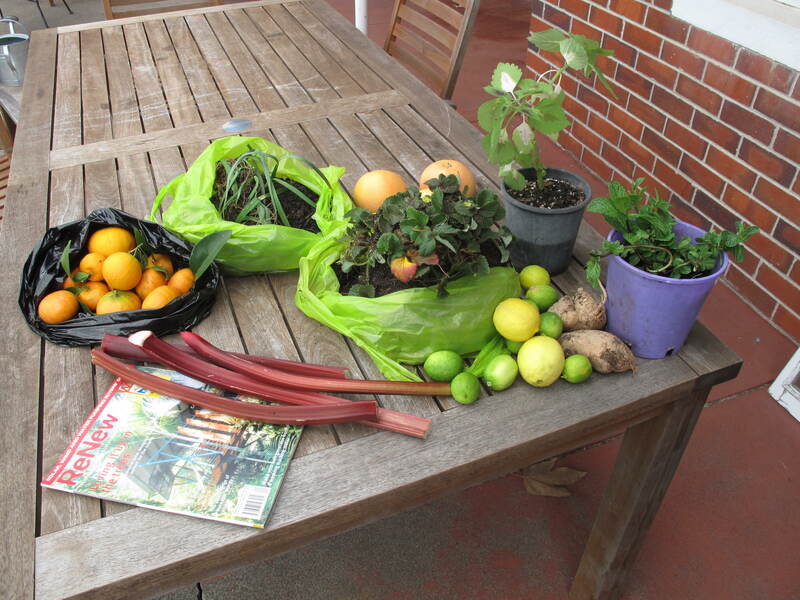 Plus everyone brings some produce to exchange – fascinating! I am changing into a gardening person! And what are you going to make Anthony with all of this delicious garden food??? I am soooo impressed. I am not a gardening person at all, don’t like getting my hands dirty! When I am an expert (ha) I will be able to tell you how to begin! There are worse things than being a gardening person. 😉 I think you’ll love it. And they are such lovely people! Gardening is very personal, you make it what you want it to be. 😀 Hugs Jules! And I know you know Laurie. i’ve become more of a gardening person in the last few years, and it brings me great joy. even when i kill things by accident. Becoming a gardening person is a good change in my view though I am only a gardening person by proxy myself. Gardening is not for everyone, but my Father and two brothers and myself all love to garden. I guess it’s an example set by my Mother when we were very young children. There’s nothing like getting out and mucking around feeling the soil between your fingers and watching young seedlings growing (or harvesting a food crop). And I think you’ll find joining a gardening group can be just as much about sharing each other’s company as digging the soil. Gardeners are such beautiful spirits, kind, thoughtful and nurturing each other just as one nurtures the soil beneath one’s feet. Start small Jullie. Try growing a few things near your back door. I daresay the enormous grounds around your house would be daunting for the novice. Good advice re starting small! The concept of a garden is one that encompasses growth and change. It’s such a great metaphor. I’ve used it to call my music a “song garden.” Planting seeds during this challenging time in your life will bring you blooms of color to counter grayness later on. Sometimes, I even think of watering that garden with tears. Thinking of you, Julie. You have such a poetic way of seeing things Judy. Thank you. New friends bearing gifts, and new chickens too. Such inspiring news, Julie! we now have this huge back yard that ends abruptly in to the woods behind us. the issue now is will we be growing a garden as angie suggested, planting flowers and trees as chris has suggested? angie wants bunnies but was not sure when i started asking more direct questions. we have some wild bunnies and even a coyote that roams the area. the coyote acts like a dog who has been abandoned. not knowing if he should interact with us or not. notice i am missing from this matter? that is because i am no gardener my friend! i love the idea of a garden but have not been responsible for such since i was a girl many years ago. just thinking about it makes me tired:) it is too late now for planting veggies and too early to plant trees and shrubs. thankfully we will have time to make up our minds. i know you must miss having anthony about to care for your garden and just for his companionship. it must have been so hard to do what was needed and move him to the care home. i hope when my time comes i have learned enough from brave people like you to do the right thing for my family. i send you love and huge warm hugs my friend, i think of you and your men each day and send out my best most loving thoughts to you. What an absolutely amazing comment, Sandra – you continue to amaze me (even though neither of us have green thumbs!) Love love love you! Well, I’m not a real fan of change. It usually drags me through the door kicking and screaming, but then I adjust to the new normal, and somehow life goes on…it sounds like you’ve found ways to adjust and people to support you in the process. Hang in there. I grew up with big gardens, and other than in the city, have planted a garden where we have lived. I gave up here in the desert, though, because it took too much water to get nothing! It went against everything I knew about growing things. After we went xeriscape front and back, I still wanted growing things–s[pots of color. This year I did the most container gardening I have ever done and actually got to eat some of it. But even if the birds, squirrels, and whatevers had gotten it all, I would have enjoyed it still–just to see green things growing in the desert. My heart is with you! I think you and Anthony are very inspiring to read your blogs and appreciate your love and devotion to each other. Reminds me of my father who was diagnosed with dementia (now gone) and stayed at home with his partner for as long as possible with the support of his family before entering permanent Care. i can remember taking Dad out on one occasion for a long lunch in a winery where he loved looking and talking about the rural landscape being an ex farmer. On return to the care facility and being tucked in for a rest before dinner – he looked at me and said “thank you so much – you people are very good to me in here!” I realised then he didn’t remember who I was but it didn’t really matter as he still appreciated the kindness. Robyn.